designers, manufactures, wholesalers, and Naples shopping. 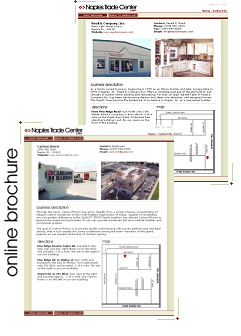 To get your business "listed" in the Naples Trade Center directory, and to create your "Online Brochure" is a one step process. Simply contact us via phone or e-mail and we'll take it from there. Once you have contacted us, we may schedule an appointment to meet with you at your location if necessary. We will let you know what information is needed for your personal listing. Click Here to view an example of a Online Brochure. The listing price is Call for Pricing.